Place corn in a heavy pot with enough water to cover kernels. Add 1 tin condensed milk. Bring to boil. Reduce heat immediately. Stir constantly and cook until kernels are soft. Add evaporated milk. 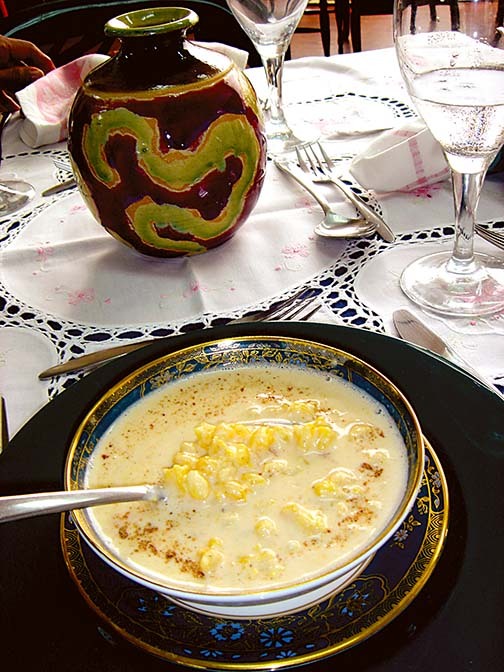 Mix coconut milk with some of the evaporated milk and add to corn. Also add nutmeg, cinnamon and vanilla.Let simmer on low heat until liquid and kernels thicken. Add remaining condensed milk and stir. Pour into cereal bowls and sprinkle with nutmeg for garnish. Prepare as above, let cool and refrigerate. Pour into dessert dishes and top with whipped cream or fresh fruit. The secret to hominy corn porridge...is in the preparation. Soak the hominy in a crock pot overnight with salt and cinnamon powder.